Recline in front of a glowing fire while the snow drifts, and the tree lights twinkle. A sip from this warm and nutty blend completes the perfect winter wonderland. Hand-picked white tea blended with almonds, vanilla and cardamom, accented by white chamomile flowers. I really like this tea. 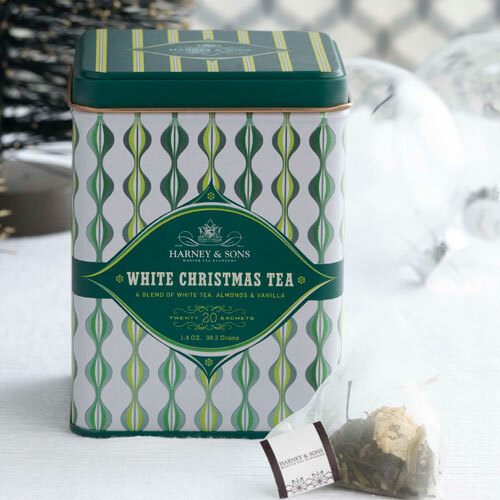 It was part of the Harney & Sons White Christmas Tea Gift 2010 (which is, at the time of this writing, out of stock), but to be honest, I was less interested in the tea than I was the chocolate covered almonds in the cool firecracker wrapping. Yeah, I’m a sucker for things like that. So, it’s really awesome that I’m enjoying the tea too! The white tea is delicately flavored (which is normal for white tea), but it is not so soft that it can’t be tasted. It has a very fresh, smooth taste with a light mouthfeel. No bitterness and no astringency. Just sweet, delicate white tea flavor. The flavor of the vanilla is creamy and rich. It is flavored “just right” here – I like that the flavor is strong, however it does not overpower the white tea. Very well blended, this tea. 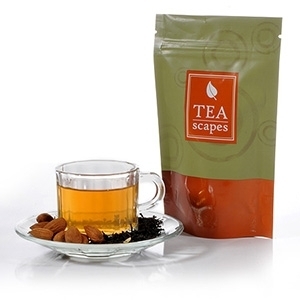 The almond flavor lends a light, nutty character to the tea and is accented nicely with the cardamom. Together these flavors are in keeping with the delicate quality of the white tea, nothing is overwhelming. The combination of flavors makes for a very cozy White Christmas, indeed! Where to Buy: Sorry, this blend is no longer available. As this blend has been discontinued by Adagio Teas, there is no description available. I know that this tea is no longer available, but I really like it so I want to share my thoughts about it with you. Adagio Teas offers a rather unique and cool service to their customers. Customers can design their own “Signature Blends” using Adagio’s teas. I have tried several of these Signature Blends from various blenders, but my favorite blender thus far is Adagio customer Rachana Carter. Now, I have to tell you, I am not a huge fan of Adagio’s black tea base. I find it to be rather harsh and astringent. That being said, I have found that when their flavored black teas are blended (like with the Signature Blends), the black tea doesn’t taste as harsh. I don’t know why that is, I mean, it’s still the same black tea base. So while I don’t really like many of Adagio Teas flavored teas, I have enjoyed quite a few of the Signature Blends. This blend is very flavorful. The black tea base is not harsh at all, in fact, I have a hard time believing that it is made with the same black tea base as the Adagio Teas flavored black teas. It is very smooth tasting with barely a hint of astringency. Very pleasant. The flavoring of this one doesn’t really remind me so much of “toasted almond” as much as it reminds me of almond extract. What it tastes like to me is a cookie that’s been flavored with almond extract… and that has been dunked in milk! The combination of flavors is very nice. 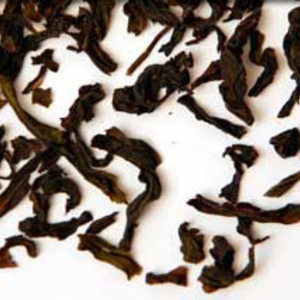 The tea is sweet and creamy, with a pleasingly robust black tea background. I am finding it to be exceptionally comforting on this chilly day. Thank you, Rachana Carter, for all of your fantastic blends! 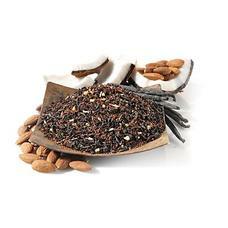 Earl Grey Vanilla Almond black loose leaf tea leaves are mixed with almond pieces and vanilla flavoring. The brewed liquor offers a pleasant flavor of bergamot mixed with the nutty tones of almond and creamy undercurrents of vanilla. This loose leaf black tea is perfect for desserts or for just a pure indulgence. This is unlike anything I have EVER smelled in my life! It’s powerful and has attitude! And I like that! The DRY Aroma – I can smell Almond right off the bat! Right after that scent follows the Earl Grey! I can smell both – both together and separately! It’s very intense! And VERY Unique! After infusing – the almond tones down quite a bit and the Earl Grey comes thru even more. The color of the infused liquid is that of a medium brown. I can taste the bold black tea wonderfully! Then I can taste the nicely done Earl Grey flavors and THEN the Almond barges thru! The vanilla slides in towards the end of the sip and smooths it out pleasantly. This is such a FUN tea! I think it’s just GREAT! I’m very impressed with the aroma, flavors, and creativity of both! This is a REAL winner! A delightful Thai restaurant blend of black and red teas, Hawaiian coconut pieces, almonds, and authentic Madagascar vanilla beans. Enjoy this delicious tea chilled with milk and Rock Cane Sugar. This tea contains nuts. Black tea, red Rooibos tea, coconut bits, vanilla pieces and almond bits. I could taste the Rooibos more than the Black Tea and I could taste the Almond more than the Coconut. I did find that the vanilla was a good pairing with the coconut but more of an afterthought or aftertaste, actually. Overall I did enjoy this blend. It had a pleasant aroma and a satisfying taste.